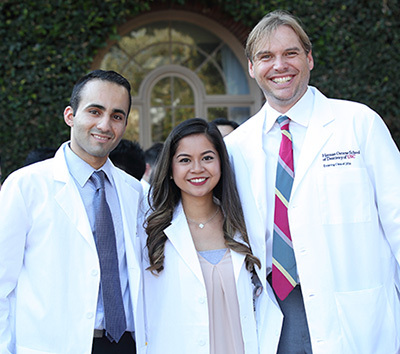 Herman Ostrow School of Dentistry students Nima Boostani DDS '20, Andrea Leigh Taguinod DDS '20 and Brian Kennedy DDS '20 attend the USC White Coat ceremony, an annual event at which the school welcomes the incoming class and their families to the profession and the university. Photo by Glenn Marzano. Since 1897, the Herman Ostrow School of Dentistry of USC has provided students with unique, intensive clinical experiences using the most advanced techniques and technologies in the field. Graduates form a tightly knit community of proud alumni, provide top-notch patient care, conduct world-class research and lead the oral health field. The school's strength is its educators. Their world-renowned expertise, combined with innovative curricula, gives students the strong clinical education they need to become great oral health professionals. The curricula include the Doctor of Dental Surgery program, the baccalaureate in dental hygiene program and postdoctoral advanced and specialty programs: endodontics, general practice residency, operative dentistry, oral and maxillofacial surgery, orofacial pain, orthodontics, pediatric dentistry, periodontology and prosthodontics. Other programs include an advanced standing program for international dentists; online master of science degrees in geriatric dentistry, orofacial pain and oral medicine; an online graduate certificate program in geriatric dentistry, and master's and doctor of philosophy degrees in craniofacial biology. The Herman Ostrow School of Dentistry's celebrated status as a well-funded dental and craniofacial research unit allows students to enrich their education through laboratory activities and bolster their clinical skills with strong scientific foundations. Through community service, the Herman Ostrow School of Dentistry provides valuable clinical experiences to the students while helping disadvantaged individuals improve their oral health. Serving the surrounding community helps students develop clinical competency and learn to treat all members of diverse communities with care and compassion. The Herman Ostrow School of Dentistry awards the following degrees: the Bachelor of Science, Dental Hygiene; the Master of Science, Geriatric Dentistry; the Master of Science, Orofacial Pain and Oral Medicine; the Doctor of Dental Surgery; the Advanced Operative and Adhesive Dentistry Certificate/MS, Craniofacial Biology; the Advanced Orthodontics Certificate/MS, Craniofacial Biology; the Advanced Pediatric Dentistry Certificate/MS, Craniofacial Biology; the Advanced Pediatric Dentistry Certificate/PhD, Craniofacial Biology; the Advanced Periodontology Certificate/MS, Craniofacial Biology; Advanced Dental Education Certificate programs in Endodontics, Geriatric Dentistry, Operative and Adhesive Dentistry, Oral and Maxillofacial Surgery, Orofacial Pain, Pediatric Dentistry, Periodontology, and Prosthodontics; Master of Science in Craniofacial Biology; and the Doctor of Philosophy in Craniofacial Biology. The Herman Ostrow School of Dentistry, the Viterbi School of Engineering Department of Biomedical Engineering and the Dornsife College of Letters, Arts and Sciences Department of Biological Sciences jointly offer the minor in craniofacial land dental technology. Grades are issued by members of the faculty to indicate to students their level of achievement and to provide information to committees given the responsibility of reviewing a student's total academic record and assigning honor or deficient status. Newly admitted students to the Doctor of Dental Surgery (DDS) program, the Advanced Standing Program for International Dentists and Bachelor of Science in Dental Hygiene (BS) students are bound by the university grading system (excluding plus/minus grades), which is detailed in the Academic Standards section of this catalogue. Grades used by course directors of required advanced specialty classes are: "Cr" — credit, "CrH" — credit with honors and "NCr" — no credit. Other notations appearing on the transcript are: "IP" — course in progress indicating that the grade in a course is not issued until a subsequent trimester; "IN" — incomplete work; "ICW" — incomplete clinical work; "MG" — missing grade; and "W" — withdraw. Students pursuing a Master of Science, Doctor of Philosophy in Craniofacial Biology and students in dental hygiene, doctoral and international classes should refer to the Academic Standards section of this catalogue. A student evaluation policy has been developed that outlines methods by which the faculty can recognize outstanding achievements by students and identify those who have difficulty meeting the School's academic standards. In this policy, the procedures dealing with the assignment and consequences of academic status, including academic probation and disqualification, are outlined in detail. It is hoped that the development of specific guidelines will eliminate confusion and minimize the amount of time spent in determining the student's status, thus allowing faculty and students to concentrate on their primary responsibility — the training of dental health professionals. Copies of student professional performance evaluation committee guidelines are available online on the Dental School intranet. A student will be placed on academic warning ("AW") if: (1) the GPA of a given Academic Time Unit (ATU) falls below a 2.0; (2) a failing course grade in a course of 1 unit or less is received; (3) a student does not successfully pass National Board Part I and National Board Part II or does not take the exams during the time-frame designated; and/or (4) if in the judgment of the Student Professional Performance Evaluation Committee, such a warning is warranted for other reasons, such as poor attendance or consistent tardiness. A student will be placed on academic probation ("AP") if: (1) a failing grade is received in 2 or more units completed in one ATU; (2) a second consecutive academic warning is warranted: (2) two conditions that justify academic warning are met in a single ATU or if a single condition is met twice in an ATU; and/or (4) a student receives an F in a module that results in an MG. A first year student in trimesters I, II or III will be placed on academic probation if: (1) the quality of preclinical work is unsatisfactory as reflected by a failing (F) grade in a module; (2) the quality of preclinical work is poor enough to jeopardize the student's timely transition to clinic with the rest of the class; (3) warranted by other factors related to the quality of preclinical/clinical work such as poor attendance, unprofessional behavior and/or poor performance in written examinations; (4) in the judgment of the Student Professional Performance Evaluation Committee, probation is warranted by other academic factors; and/or (5) recommended by the Group Practice Director, due to quality and/or quantity of clinical work. A student will be placed on Clinical Probation upon recommendation of the Group Practice Director if a grade of "F" is received in any of the graded categories of Group Practice performance, or, in the judgment of the Group Practice Director, probation is warranted by other factors related to the delivery of health care or clinical accomplishment. A student will be considered for disqualification if: (1) at the end of any trimester during the first year (trimesters I,II, III), a student's continued lack of preclinical accomplishment is significant enough to suggest a deterioration of preclinical skills; (2) a second academic probation is warranted; (3) a failing grade is not reconciled; (4) at the end of the academic year the grade point average for the preceding year is below 2.0; (5) academic probation is warranted while repeating a trimester on probation; (6) a deficiency in any area is determined by the Student Professional Performance Evaluation Committee to be insurmountable; (7) at the end of the second trimester of the Advanced Standing Program for International Dentists (ASPID), the cumulative average is less than 2.0; (8) it is recommended by the Group Practice Director, based on severe and irreconcilable deficiencies relating to the quality and/or quantity of patient treatment; and/or (9) at the end of any trimester following trimester VI, a student's ongoing lack of clinical accomplishment is significant enough to suggest a deterioration of skills and/or inadequate treatment of patients assigned to his/her care. A student will be placed on academic warning ("AW") if: (1) the GPA for any given Academic Time Unit (ATU) is less than 2.0; (2) a failing grade is received in a 1-unit (or less) course; and/or (3) a grade of "D" is received in a 3-, 4- or 5-unit course. A student will be placed on academic probation ("AP") if: 2 units or more of failure are recorded at the end of any trimester; if a second consecutive academic warning is warranted; or if, in the judgment of the Student Professional Performance Evaluation Committee, probation is warranted. A student will be placed on clinical probation if, in the judgment of the Clinical Director, probation is warranted by other factors related to the delivery of health care or clinical accomplishment. A student will be considered for disqualification if: (1) a third probation is warranted at the end of any trimester; (2) a failing grade is not reconciled; (3) at the end of the academic year the grade point average for the preceding year is below 2.0; (4) academic probation is warranted while repeating a trimester on probation; and/or (5) a deficiency in any area is determined by the Student Professional Performance Evaluation Committee to be insurmountable. In addition to the Dental School evaluation policy (which evaluates courses taken in the Dental School), students in the Dental Hygiene Program are also bound by the University's academic status requirements. A student will be placed on academic probation if a failing grade is received in any course or if, in the judgment of the program director, a student's performance warrants such status due to academic or other factors. A student may be disqualified if: (1) the stipulations of a probationary period are not met by the required deadline; (2) a failing grade is not reconciled in the period specified by the course director; and/or (3) a deficiency in any area is acquired which is determined by the program director to be insurmountable. A student who is placed on academic probation a second time can continue in the program only with the approval of the program director and the Advanced Student Professional Performance Evaluation Subcommittee. The Herman Ostrow School of Dentistry recognizes excellence in achievement by assigning special honor status during the course of study and by presentation of awards upon graduation. Students who complete all course work by a prescribed deadline and earn a grade point average of 3.5 or above for a trimester are eligible for and will be considered for placement on the Dean's List for that ATU. Placement is not automatic and is not based on any single marker of performance. Students shall not be placed on the Dean's List if they are on academic warning, academic probation or continued academic probation at any time during that trimester, or have been found guilty of or engaged in a direct resolution of an ethics violation. The local chapter of Omicron Kappa Upsilon (OKU), a national dental honor fraternity recognizes the top 10 percent of each doctoral dental class at the end of each academic year (August) by including these students on the OKU Honor List. The determination of the top 10 percent is based on a yearly GPA. It should be noted that placement on the OKU Honor List has no relationship to membership in OKU, which is based on overall academic achievement and professional development. There are numerous awards made each year at graduation to recognize excellence in members of the graduating doctoral, dental hygiene and ASPID classes. A complete listing is available at the Herman Ostrow School of Dentistry. The Herman Ostrow School of Dentistry recognizes that in some special instances it may be necessary or beneficial for a student to interrupt or discontinue dental education. A student wishing to withdraw from School or request a leave of absence must contact the Office of Academic Affairs for procedures to be followed. An approved leave of absence will not be granted for more than one year. Students at the School of Dentistry who have not been formally dropped by the School, are considered enrolled each term unless they have submitted a letter of intent to withdraw. A student's verbal indication that he or she intends to withdraw or failure to settle a fee bill are not sufficient to eliminate the student from class rosters. Final course grades will be collected for students who do not have a letter of intent to withdraw on file with the Office of Academic Affairs. A student who withdraws at any time during the first three weeks of a trimester will receive no grades for enrolled courses. A student who withdraws after three full weeks of an Academic Time Unit (ATU) will receive a mark of "W" for all enrolled courses not completed. Withdrawal is not permitted after the 12th week of a trimester. The University of Southern California recognizes and acts in full compliance with regulations set in accordance with the Family Educational Rights and Privacy Act of 1974 (The Buckley Amendment). A student may have access to all records about him or her maintained by the university except those considered confidential under the act. Students of the School of Dentistry wishing to review records or to appeal for a change in those records should contact the Herman Ostrow School of Dentistry of USC Registrar. A small charge may be made to cover the time and costs of duplication of the record. Tuition at the Herman Ostrow School of Dentistry is charged on a flat fee basis for enrollment in the regular degree and advanced certificate programs of the school. Exceptions do not apply to students who have courses waived based on their prior education. In such cases, students are charged the standard flat fee for the program in which they are enrolled. Auditors pay the regular tuition rate. Auditors are not required to participate in class exercises (discussions and examinations); they receive no grades or credit. The information outlined here is for Herman Ostrow School of Dentistry fees and tuition deposits only. For information about Herman Ostrow School of Dentistry tuition and university fees, refer to the Tuition and Fees (Estimated), Fall 2017 section of this catalogue. The university reserves the right to assess new fees or charges as it may determine. Doctoral dental and Advanced Standing Program for International Dentists students only; spring only. Doctoral dental program and Advanced Standing Program for International Dentists students only; fall only. Figures shown below are approximate. The Herman Ostrow School of Dentistry reserves the right to change fees at any time. Detailed information concerning financial aid programs available to dental students can be obtained by contacting the Herman Ostrow School of Dentistry of USC Office of Financial Aid at (213) 740-2841, uscsdfa@usc.edu or visit dentistry.usc.edu/admission. The following progressive degrees are available for students enrolled in the Dental Hygiene program: MPH at the Keck School of Medicine, and MA in Gerontology from the USC Leonard Davis School of Gerontology. Applicants to the program must have completed 64 units of course work and must submit their applications prior to completion of 96 units of course work. Applicants do not have to submit GRE scores, but are expected to have a minimum GPA of 3.0 at the time of application. The application for admission to a progressive degree program must be accompanied by an approved course plan proposal and letters of recommendation from two USC faculty members. The requirements for both the bachelor's degree and the progressive degrees must be satisfied. For further details on progressive degree programs, see the Requirements for Graduation page. The Herman Ostrow School of Dentistry of USC Office of Continuing Professional Education provides wide array of continuing education courses, national and international symposia, hands-on workshops, live patient experiences, on-line modules, webinars and travel and learn programs. These educational activities are designed to provide up-to-date and innovative concepts and trainings to dentists, dental hygienists, dental technicians and auxiliary personnel, and to provide the dental community with the opportunity for life-long learning from outstanding scholars. The Herman Ostrow School of Dentistry of USC is an ADA CERP (American Dental Association Continuing Education Recognition Program) and AGD (Academy of General Dentistry) Recognized Provider. Courses fulfill continuing education requirements of the dental boards at different states in the United States for re-licensure of dentists and allied dental professionals. Courses are provided throughout the year on various subjects of dentistry: oral health, dental esthetics, oral medicine, physical diagnosis, dental materials, dental laboratory techniques, dental management, endodontics, periodontics, implants, oral surgery, restorative dentistry, fixed and removable prosthodontics, instrumentation, occlusion, oral pathology, dental hygiene, dental auxiliary education, patient education, pharmacology, principles of dental practice, radiology, sedation and emergencies. Course schedule and brochure can be viewed online at dentalcontinuingeducation.usc.edu and online registration is available. Inquiries can be sent to Herman Ostrow School of Dentistry of USC Office of Continuing Professional Education, 925 West 34th Street, Room 201J, Los Angeles, CA 90089-0641, (213) 821-2127, FAX: (213) 740-3973, email: cedental@usc.edu.